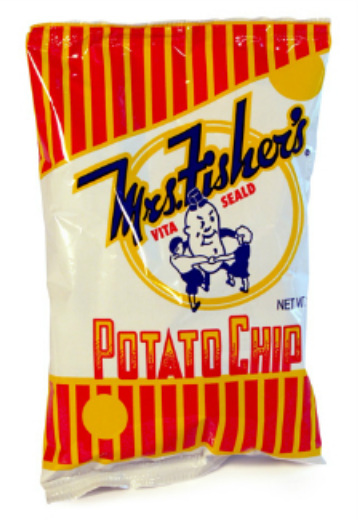 Mrs. Fisher's Potato Chips was founded in Rockford, Ill., by Mrs. Ethel Fisher in 1932. Ever since, the company has formed a time-honored tradition to manufacture delicious, homestyle potato chips. It was actually Mr. Fisher, Eugene, who came up with the idea to produce potato chips for a living. The Mrs. Fisher's dancing potato logo was originally designed by Eugene in 1932. The logo has become one of the most recognized icons in the region. In order to make extra income during the Great Depression, Eugene and Ethel started cooking chips in their basement on a two-burner wash stove. Now, Mrs. Fisher's Chips is one of the oldest "chippers" in the Midwest. "We are dedicated to serving our community and providing a quality product to all of our customers," say Roma and Mark Hailman, the new owners of Mrs. Fisher's.